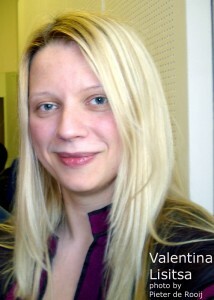 I invite you to have a look at my second youtube-video of brilliant pianist Valentina Lisitsa. She plays the Rachmaninoff Prelude Op.32, no.5, recorded by me at the Guildhall School of Music and Drama in London, 2 April 2009. I made the recording with my Zoom H4. She played four Rachmaninoff preludes and ‘Träumerei’ from Schumann’s ‘Kinderszenen’. I interviewed and filmed Valentina and in the course of this year I will publish my material on youtube and I will also use this material for assembling a video-portrait on Youtube and a dutch music radioprogramme. For more info on my interview with Valentina see my former blog-message, via this link. Hope you will enjoy the video! This entry was posted in Western Classical Music by Pieter de Rooij. Bookmark the permalink. What you did , you did well, Congratulations for recording a so beautiful performance of Valentina . I found Valentina 1 month ago on Youtube , and any evening i need to listen to her as the perfection of playing the piano . This piece of Rachmaninoff (unknown until to-day ) is played by Valentina with talent and great heart ! Many Thanks agtain , and if you have a link with Valentina tell her, please, her fans are very numerous. Such a beautiful and touching rendition of this Rachmaninoff Prelude leaves one transported into another world of total enchantment and perfection, such as is seen only in the depths of true mastery of composition and performance. Bravo to all connected with such genuine art.